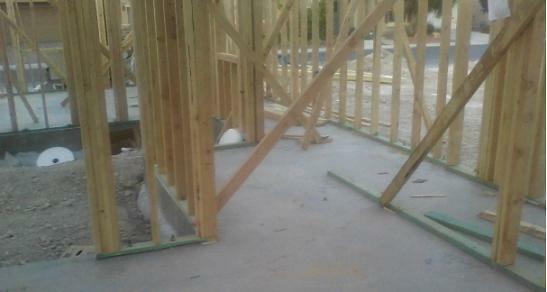 Framing a wall or wall framing in general is the first structural element to be installed when framing a house project. On the other hand, framing basement walls unless they support the main structure, are left to be done at the very end, sometimes not done at all until the homeowner decides to add value or add more room to his house. For all wooden frame houses with basement, framing floors is the first structural element to be installed. Understanding which building element to be installed first is a key element in knowing how to frame a house. frames for windows where a header, king and jack studs are attached to the wall before the wall is lifted and placed at its permanent location. In the case of walls with predrilled holes at the bottom pressure treated plate, the wall is lifted in such a way to align the predrilled holes with the anchor bolts before lowering in place and bolted. Once the wall is up and before tightening the anchor bolts make sure the bottom plate aligns exactly with the chalkline layout. Next check and make certain the wall is upright and vertical. 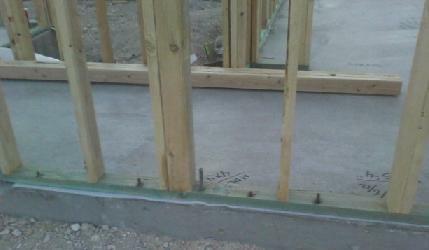 This step is where braces are needed to hold the wall in place while the rest of the walls are being added. These required braces will need to be installed and should remain in place until the floor joists and floor sheathing are installed. In most cases the temporary braces will remain in place until the roof trusses and roof sheathing are in place. Framed walls can be very heavy to lift and will be a challenge if there are not enough helpers or no crane to aide in lifting. If you frame using 2x6 studs, use 8 ft length wall sections and for 2x4 studs use 12 to 14 ft wall sections depending on how many people available to help with lifting. 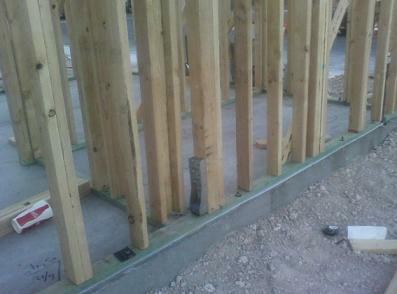 Some framers especially diyers only install every other stud to make the wall lighter to lift. The remaining studs will be added after the wall is at its final location. Since walls bolted to the foundations will need to be lifted about 3 inches above the working surface in order to clear the anchor bolts, you might have to go with much smaller wall sections. Again this is a decision to be made based the availability of help. Nailing of waferboard to the stud wall is much easier if done while the stud wall is on flat surface prior to lifting and placing at final location. The weight of heavier wall to be lifted will be a big factor versus adding the wafer board sheets after the wall is in place. When building walls on second floors or higher levels, installing wall sheathings after the stud wall is lifted and placed at its final location becomes less appealing. Though still an option, height become an issue and the effort to lift and install the waferboards from the outside will be far more challenging.